Hey! There's a Comic with my Name in it! A Devil's Due comic book called Ninjatown: The Adventures of Wee Ninja: Volume 1 just came out last week. I finally obtained a copy yesterday. I'm told Graham Crackers Comics has been selling out of them. It features stories and art by the wolrd famous dynamic duo Franco Aureliani and Art Baltazar. There is also art (cover too!) by Bill Halliar. Then there's a ten pager by yours truly in the middle. After a long hiatus, I believe it is time to revive our once a month sketchbook night. So, first we need to decide on a central location (with good seating, lighting, food and booze) in the Chicago area since everyone is spread out. All suggestions are welcome, so let's hear your thoughts. We also need to think of a name! Doctor! Ain't there nuthin' I can take? I said, Doctor! 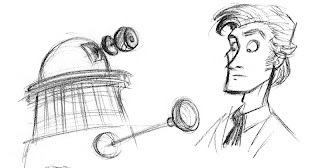 To relieve this Dalek ache? The link to purchase Peeking Duck is now up! It's just under the "About Me" section.